Start in seated position with legs in mountain top position and hold paddle straight out off of chest. Pull abdomen in and roll halfway back, pulling elbows into rib cage. Turn torso to the left while dipping paddle end into the water, repeat torso turn and paddle dip to right side. Return torso center, raise arms directly overhead. 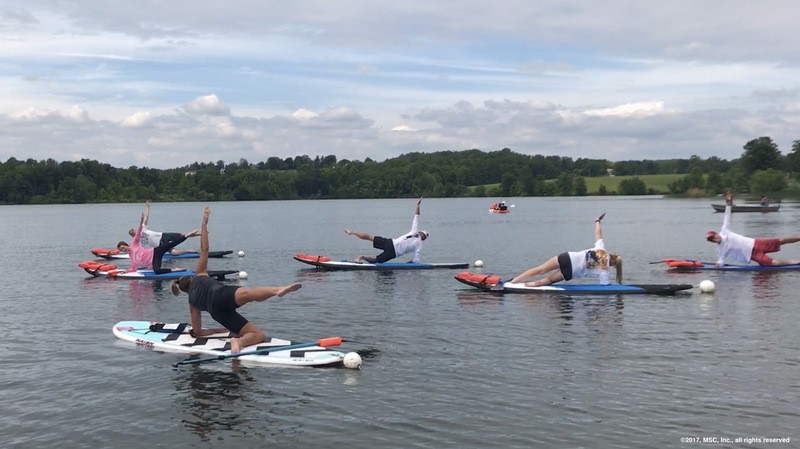 Straighten legs and reach paddle out towards toes. Lay on left hip with legs extended and prop upper body onto left forearm. Bend left leg to the back, keeping knees together. Raise right hip up then follow by raising right arm up to head. Now raise right leg up to 45 degree angle keeping knee facing forward. Hold. Finish move by lowering leg, arm and the hip. Repeat on right hip. Start in 3 legged down dog pose. Shift shoulders over wrists and bring right knee to chin. Push back up in to 3 legged down dog. Repeat 5 times per side.